Organization representing Palestinian religious leaders praises the UNESCO denial of Jewish ties to the Temple Mount. 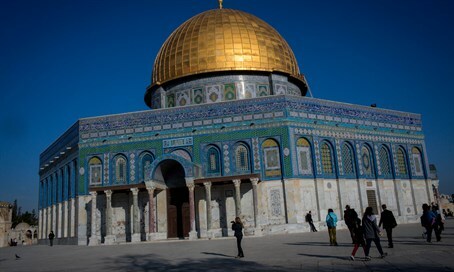 The Association of Palestinian Scholars and Preachers praised the controversial decision of UNESCO, which recently denied Jewish history at the Temple Mount and referred to the area only as the religious Islamic sites "Al-Haram Al-Sharif" and “Al-Aqsa Mosque." The Association declared this decision a victory for the religious and historical legitimacy of the Al-Aqsa Mosque, which is built on the Mount - the holiest site in Judaism. The Association further declared that the term Temple Mount is an "historical lie" invented by Jews, and that history is not allowed to be established on “lies," in an ironic statement given that the First and Second Temples stood at the site, as has been repeatedly proven by archaeology. Furthermore, according to the Association, the expression "Al-Aqsa" is the religiously, historically and politically correct word which points to the Muslims right from 1,500 years ago, indicating a period a full 1,000 years give or take after the destruction of the First Temple when Islam was created. They also requested that UNESCO make another decision on maintaining the sanctity of the mosque and the right of Muslims to hold a religious ritual there at any time.